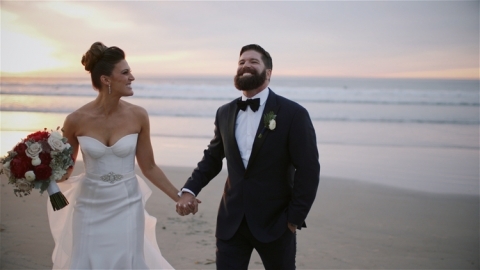 We were SO excited when Stefanie and Scott got in touch to have us film their Scripps La Jolla wedding. We had just filmed her sister’s wedding 7 months earlier. That made it really great to see them again. We loved getting to know their story throughout the day. They met at a Taylor Swift concert. The invitation had a subtle photo of TS which was a great way to bring that in. I loved that all the bridesmaids wore white dresses and everyone was so happy and fun! The groomsmen had some misadventures while surfing in the morning but they also were super fun and having a great time. We had the most incredible light for the ceremony, and the flowers were amazing. One thing we absolutely loved was the way that Scott was just so enthusiastic about the day. We always love filming the groom’s reaction to his bride coming down the aisle but we not only got that amazing shot but the one with him coming down the aisle himself! He was sooo excited to get married. We learned a little more of their story through the officiant and through their sweet personal vows. And then to round out the excitement in the ceremony, the two recessed down the aisle with that same exuberance as they arrived. They did some photos by the beach while everyone enjoyed cocktail hour and then kicked off the night with an energetic grand entrance and first dance. Their toasts were so sweet and thoughtful but the sweetest one was by the groom himself! He told their story from his perspective and it was so incredibly cool to hear the excitement in his voice about getting married to his bride. I hope they relive that excitement after 50 years of marriage! We wish them the very best. We hope you enjoy this Scripps La Jolla wedding.